Nathaniel (Nat) Davenport from the Spring 2015 semester has been having a killer swimming season. 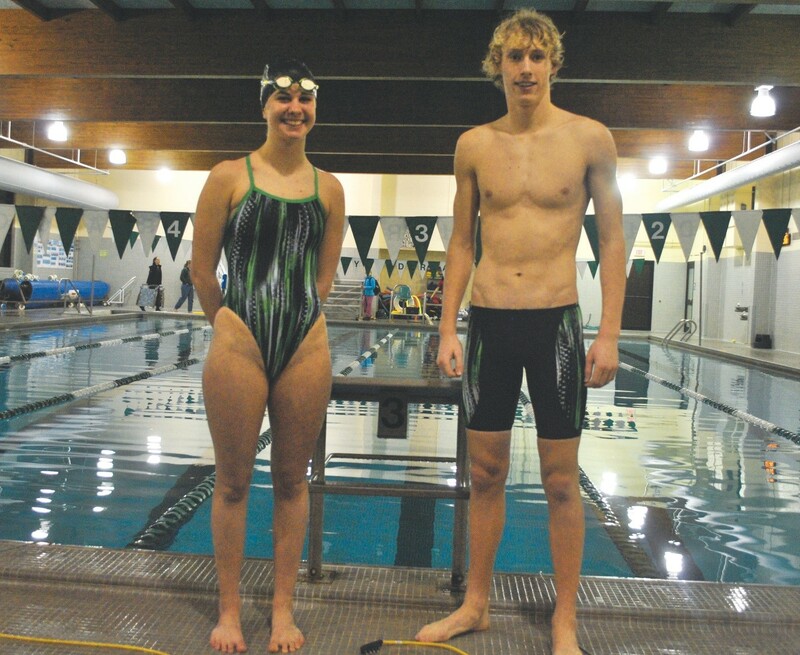 Earlier this month Nat won two Division 2 state titles and was on a relay team that captured a third title for his Duxbury high school swim team. Nat’s state titles were in the 50 free and the 100 free with times of 21.14 and 46.34 respectively. The third title was from a 200 free relay with an impressive overall time of 1:28.42. Nat has been an integral part of his school’s swimming success this season which has allowed his team to remain undefeated. Congratulations Nat! We hope to hear more of your successes soon! 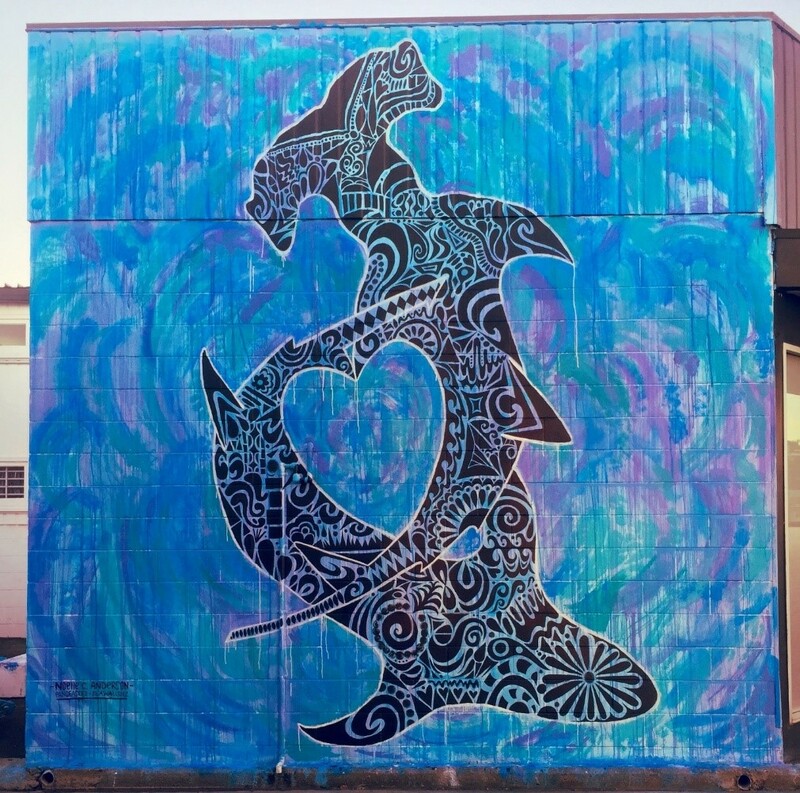 This statement was the basis for the artistic work produced by Noelle Anderson from the Spring 2013 Island School semester while she spent time in Napier, New Zealand this winter with PangeaSeed painting a mural for their Sea Walls project. Since returning from The Island School three years ago, Noelle has been busy. 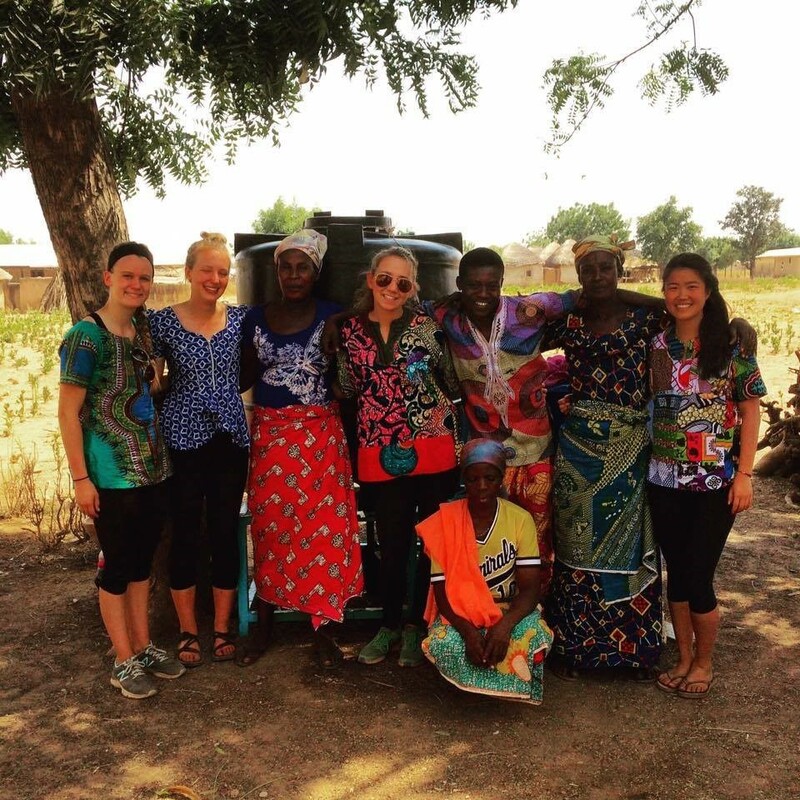 While still in high school, she founded a “Positivity Club” with fellow Sp ’13 classmate Greta O’Marah. The goal behind this club “was to make our community a less stressed one, and to get fellow students to focus on what is truly meaningful and important to them through positive thinking techniques.” Both Noelle and Greta agree that their inspirations for this club came to them entirely through their experiences at The Island School. Additionally, Noelle participated at the Varsity level in skiing and tennis as well as pursuing her interests in “the intersections of sustainability, social justice, and art by focusing on ‘EcoFeminism’ for my AP photography series.” Noelle has since been attending Dartmouth where she studies Geography and Studio Art as well as participating in the Dartmouth Ski Patrol which allows her to get out on the hill and put her Outdoor Emergency Care certification to good use. Noelle’s journey to New Zealand this winter began when PangeaSeed itself reached out to her. 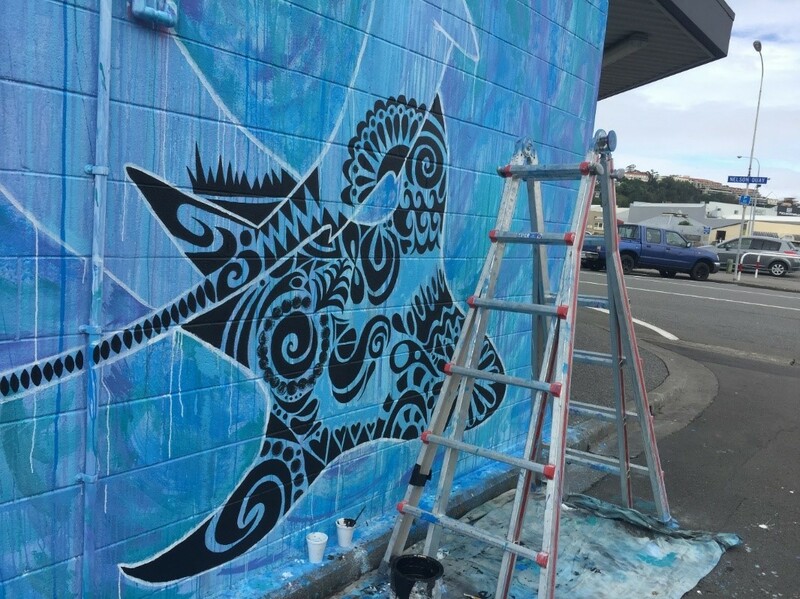 They asked her if she would like to join their Sea Walls: Murals for Oceans in Napier, New Zealand which is located on the North Island of New Zealand. In disbelief, Noelle spent the winter creating her initial sketch, and moving her final projects and exams at Dartmouth to an earlier time so that she could leave campus accordingly. When Noelle got to New Zealand, there were 30 other artists joining various other painting projects. 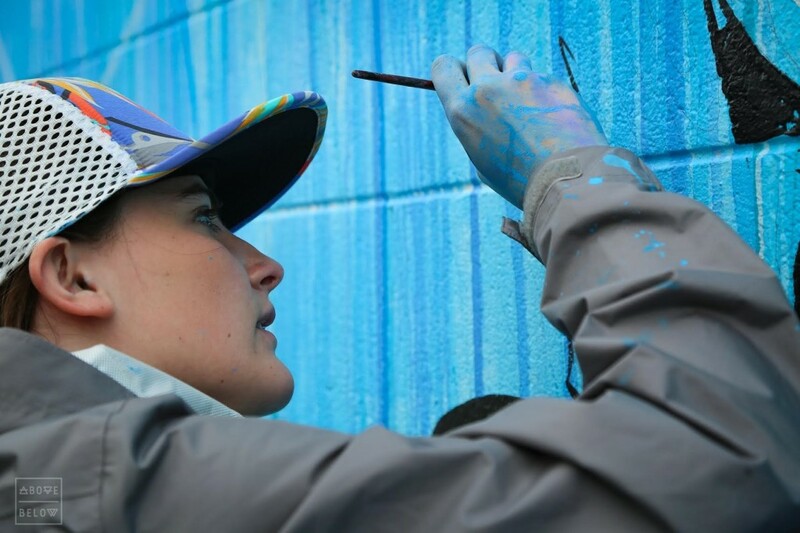 Noelle was initially intimidated because many of these other artists were “internationally acclaimed professional street artists, and I am just a student who has never painted a mural before” but, once Noelle began work on her mural, she fell into her routines she had developed for her other projects and that allowed her to settle in and be confident in her progress as the mural took shape around her. 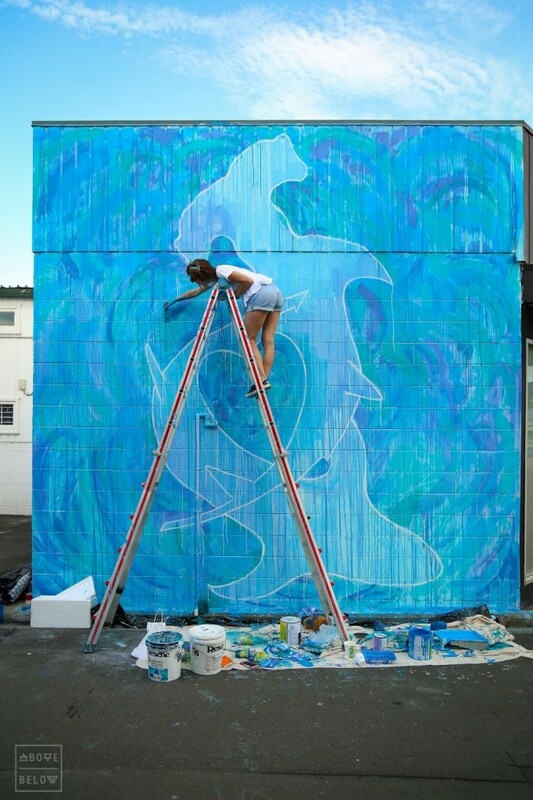 As Noelle worked, the wall in front of her became “my canvas and the street was my studio!” There were certainly challenges to the process that included: “sketching out my shark figures without a projector, being rained out two of the 6 painting days and feeling the pressure of time, and lastly balancing answering passerby’s questions in an engaging manner while still trying to stay focused.” For Noelle, the process of creating this mural was extremely rewarding and she attributes this to feeling more physically connected to the work – “more so than any piece I have created at home or at the studio at Dartmouth, due to the way I had to move my body through space in order to apply paint onto my wall. Noelle, best of luck to you from all of us at The Island School! We hope that Earth Week was a blast and that your work continues to be an inspiration for all who see it! What do aquaponics and type-2 diabetes research have in common? Curiously enough it turns out that The Island School is the common link! Christopher Teufel attended The Island School in the Fall 2013 semester after learning of the program from Bart (F’04) and Jake Cerf (F’05) who lived nearby in Chris’s neighborhood. Chris was close to Bart and Jake because they were “the only male babysitters I had and also the only people who would have pillow fights with me and let me stay up and eat ice cream on a school night.” When Chris entered high school it was the mother of Bart and Jake, Beppy, who dropped a hint to Chris’s parents reminding them of the program. It certainly helped in Chris’s case that “all my life I had been interested in marine science and the environment.” From there, the rest is history. Chris applied and attended The Island School saying that “my semester at IS did more for me than I could have ever imagined. I not only became more confident with my interpersonal relationships but also realized that I really am interested in scientific research and that this career path could very likely be the one for me.” Speaking of scientific research, Chris is currently pursuing two projects. 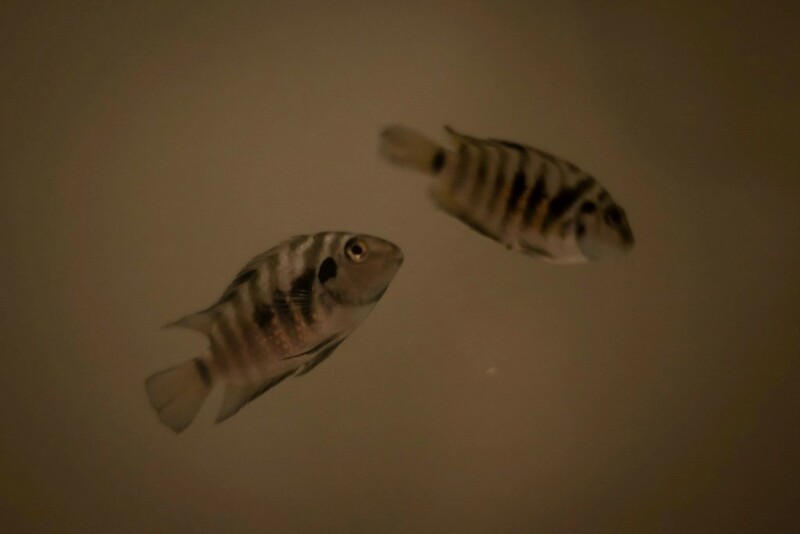 One is a homegrown aquaponics study on cichlid fish conducted in Chris’s basement and the other is type-2 diabetes research at Jackson Laboratories (JAX) in Bar Harbor, Maine. When Chris first entered high school, he retained his interest in all things environmental but broadened that interest further to include biology. The result was the discovery that Chris was interested in medicine, specifically research revolving around genetics. Last summer, Chris received an “email from one of the STEM coordinators at my school regarding the opportunity to participate in a class outside of school conducting graduate level research in conjunction with Jackson Labs and three other schools around the nation.” These other schools were: Maine School of Science and Mathematics, North Carolina School of Science and Mathematics, and Rockdale Magnet School for Science and Technology. Chris jumped in with two other students from his school and “began this class with minimal programming technology and a relatively limited knowledge of computational genomics. Needless to say the learning curve was steep and we have certainly struggled but in the past month or two are definitely proud of the results we obtained and the knowledge gained from this experience.” This type of research never truly ends so if Chris’s interest continues, he could have all the experience he ever wants in this field. Chris has, despite the relative differences between his two fields of study, been finding common ground between the two. His research on fish focuses on reactions to external environmental stimuli and his diabetes research involves the effects of genetic predispositions. In other words, his two projects create the classic nature vs. nurture debate that many scientists worldwide are studying. In the future, Chris is interested in examining the dispute of nature vs. nurture “in a variety of biological situations from levels of aggression in fish to a diabetic precursor in humans.” Chris hopes to return to his work at JAX in the future to further the study but has to put his work with cichlid fish on hold for his undergraduate years. He is, however, open to the possibility of more aquaculture research in the future. “This is a tough one. I would definitely like to give shout outs to Emma, my advisor and histories teacher who I was recently informed will be departing Island School soon, Peter Z for fanning the flames of my interest in marine ecology, John Schatz for being my running buddy and making sure we stayed relatively well-behaved, Catherine Klem for being a great math teacher and phenomenal kayak trip leader (let me know if you’re up at Sugarloaf anytime soon!) Ron and Karen Knight for your friendship and guidance throughout my semester, Will Strathmann for furthering my photographic knowledge and saving my camera gear on that fateful first day of our kayak trip, and the many other characters who contributed to my phenomenal experience. Of course, shout out to Fall 2013 for being some of the greatest friends I’ve ever encountered. Best of luck to you, Chris, with your next steps in college and beyond! All of us at The Island School look forward to hearing more from you in the future. CEI and The Island School were well-represented at the regional 2016 Bahamas Natural History Conference, with representatives giving talks on plastics, climate change, rare shrimp, turtles, conch, sharks, and lion fish. More excitingly, the first Island School alumna joined with the research team! 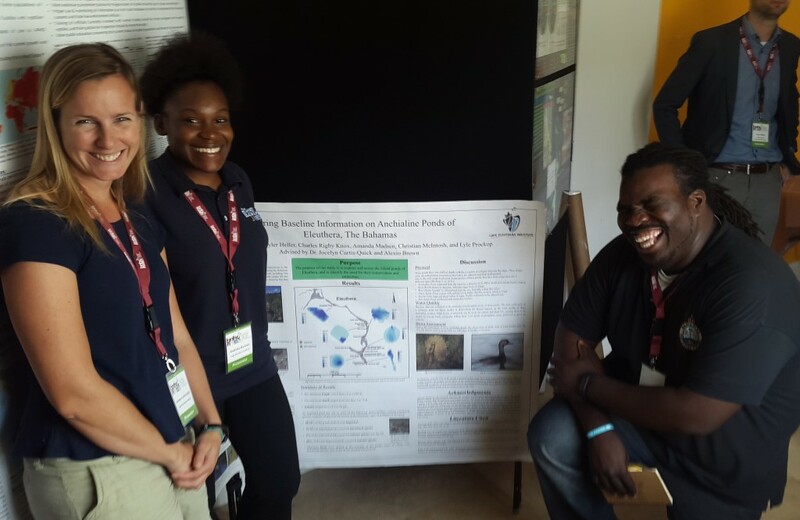 Andrieka Burrows, BESS (Bahamas Environmental Stewards Scholars) scholar of Fall 2015, attended the conference to present the anchialine ponds poster. Anchialine ponds are landlocked bodies of water with marine characteristics that are connected to the sea through underground conduits. There are over 200 of these ponds on the island of Eleuthera, however, there is very little known about these ecosystems. Dr. Jocelyn Curtis-Quick and Alexio Brown, with a team of Island School students including Andrieka, gathered baseline data on the ponds in order to determine their status and need for protection. The students found an alarming number of the ponds were impacted by humans. To conserve these ecosystems, there is a need to raise awareness. 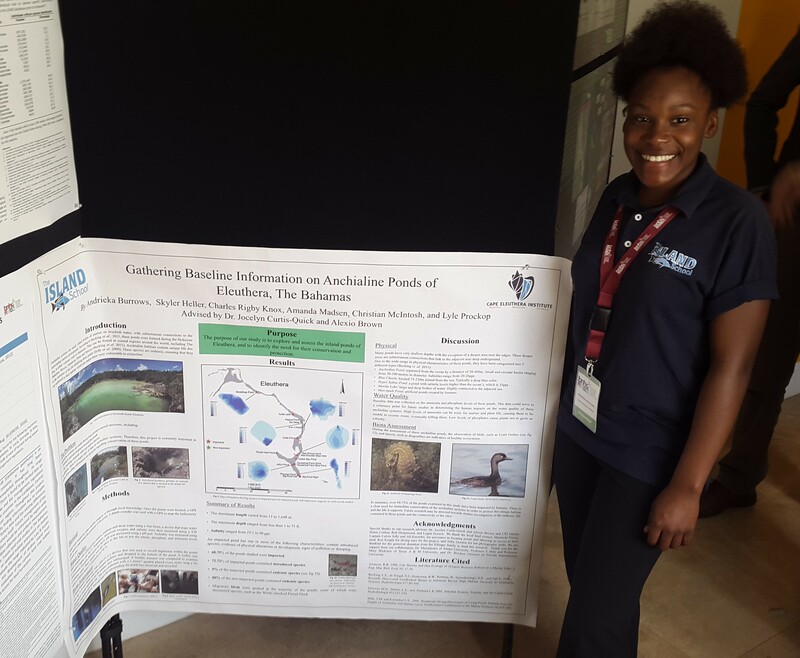 Andrieka did this by presenting the work of her research class at the Bahamas Natural History Conference (BNHC). 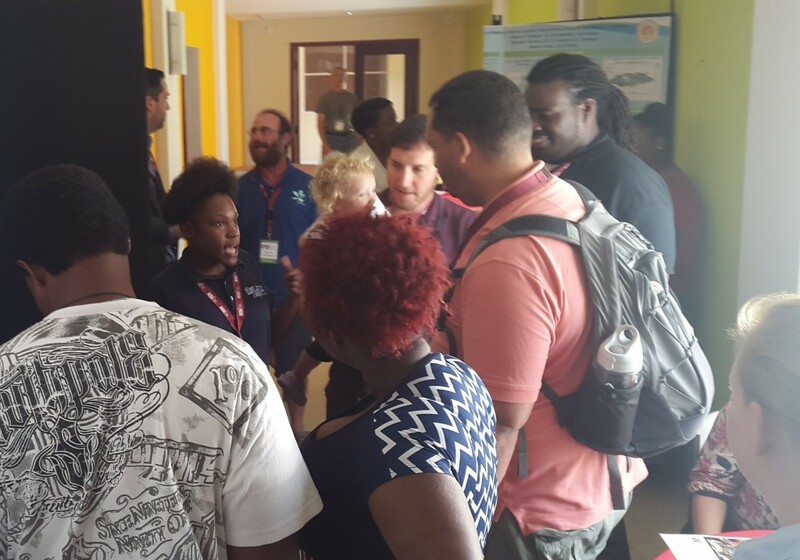 The conference was hosted by the Bahamas National Trust (BNT), who manage the protected areas in The Bahamas. Andrieka spoke about why these ponds are so understudied, and her hopes for more research to be carried out in the future. Andrieka created much interest in ponds and did an exceptional job presenting her poster, making her research advisers very proud. Meredith Howe and Emily Jenkins from the Summer 2014 semester returned home to their sending schools with a goal to reduce the daily amount of plastic that they consumed. This goal led to the creation of a group called the Broken Bottle Project with the help of a third friend, Meghan Vonck. The catch is that each of the three friends attended a different school in the same district. Meredith is a senior at Forrest Hills Northern, Emily is from Forrest Hills Central and Meghan is from Forrest Hills Eastern. The three of them banded together to reduce plastic water bottle usage across their entire district. We caught up with Meredith and Emily to learn just how they are accomplishing that goal and what they have planned next. 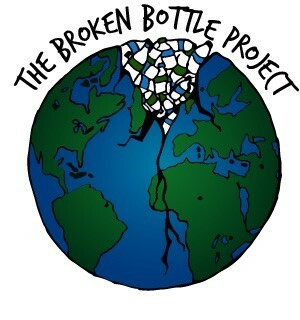 For Meredith and Emily, the Broken Bottle Project “started with a passion for the environment and a passion to make a difference.” For Emily in particular, her passion for bettering the health of our planet stemmed from what she learned at the Island School. Inspiration came in the form of a teacher from Forrest Hills’ Gone Boarding class (a senior-only class where students design and build their own surfboard, longboard or snowboard and create a business partnership with snowboarding giant Burton) who prompted Meredith to think about what she could do to “get our district more informed and excited about the environment.” That same teacher then put Meredith in contact with Emily and Meghan who, after several months of planning, launched the Broken Bottle Project. 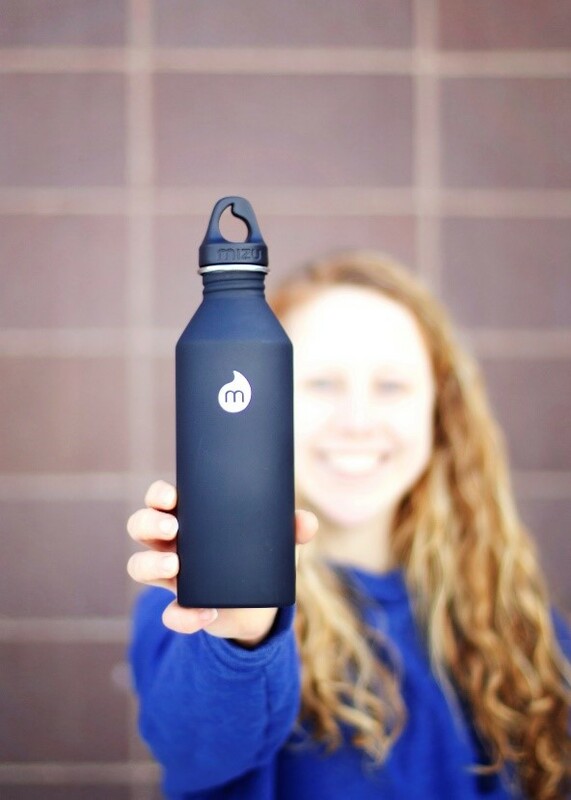 Together they had “noticed the numerous people in our high schools drinking from single-use plastic water bottles, and we decided we wanted to change this.” Together, the three of them set out to initiate change throughout their entire school district. The Island School strives to be a “zero waste” campus and a model of sustainability for the region. While here, this caught the attention of Emily and Meredith. Emily found herself pondering while on a dive “I wonder where this plastic goes?” after witnessing some of it drifting through the reef she was at. Fortunately at The Island School, we answered that question for her and that answer prompted Emily to dramatically reduce the amount of plastic she uses in her day-to-day life at home. She even carries this with her to events where large amounts of plastic bottles are being used, such as “last night at my ski team banquet. I noticed the large amount of plastic water bottles being used and I went out of my way to create a recycle bin. I took all the bottles home and recycled them myself.” For Meredith, her sea-change moment came when she realized the scale of the problem. One plastic bottle will not do much harm, but, what about 1,000? Or 1,000,000 bottles floating in the ocean? It adds up quickly. So too does the effect when people use fewer plastic bottles or recycle them properly. The solution is simple: reusable water bottles and filling stations around the campuses of the school district to keep those bottles full. 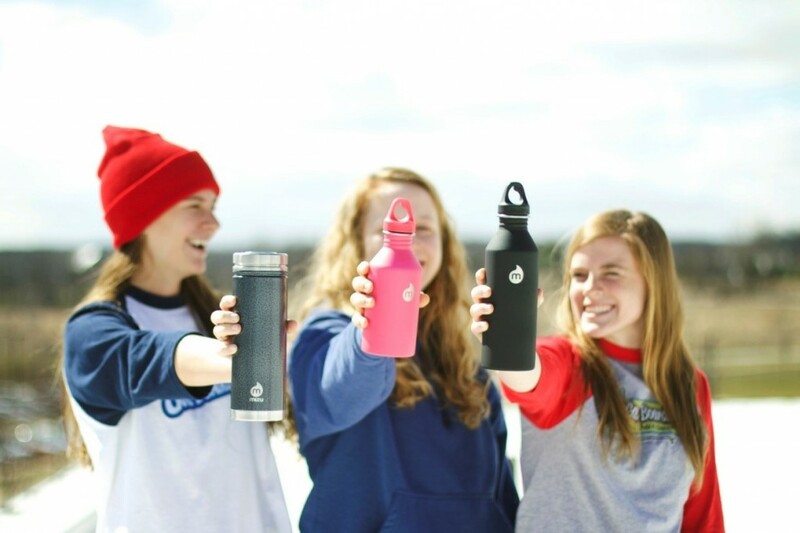 Emily, Meredith and Meghan made a connection with MIZU who they agreed would be their ideal supplier for these water bottles. They then agreed on a design that would grace the side of the bottle. Now they are raising money, implementing their water bottle filling stations, and taking care of all the logistics. 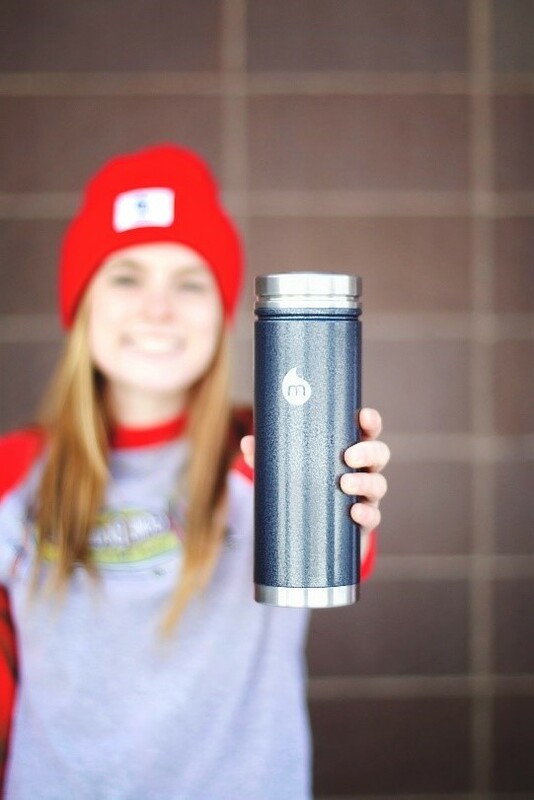 The goal is to raise about $12,000 which will allow them to meet the wholesale price of the water bottles before they distribute them to the school district. The process of reaching out to sponsors and coordinating a multi-school campaign has taught Emily, Meredith and Meghan a lot. Currently, with graduation on the horizon they are investigating options for how to pass the program off to a new group of student leaders. They expect the project to really take off towards the end of April. My favorite memory during my time at IS Su ’14 is searching for the Banyan Tree with Kate, Evie, Annie Gray, and of course Pibl. Also, the first night when the girl’s cabin played “ice breaker” games. From the Island School, I would like to thank all my fellow peers who helped me become the person I am today! At IS, I really grew as a leader and learned so so so much about myself. I am thankful for pals like Clay Starr and the many others who graduated with me!!! My favorite memory from IS is definitely the down island day where we jumped in the ocean hole, explored Hatchet Bay Caves, and camped (in a rain storm) at Club Med!! Honestly one of the best days of my life. From everyone at The Island School, best of luck to you, Meredith and Emily! You are well on your way to success and we can’t wait to hear more about the awesome things you accomplish! Catherine Argyrople from the Spring 2014 semester has recently exceeded all of her expectations when it comes to creating a business from scratch. 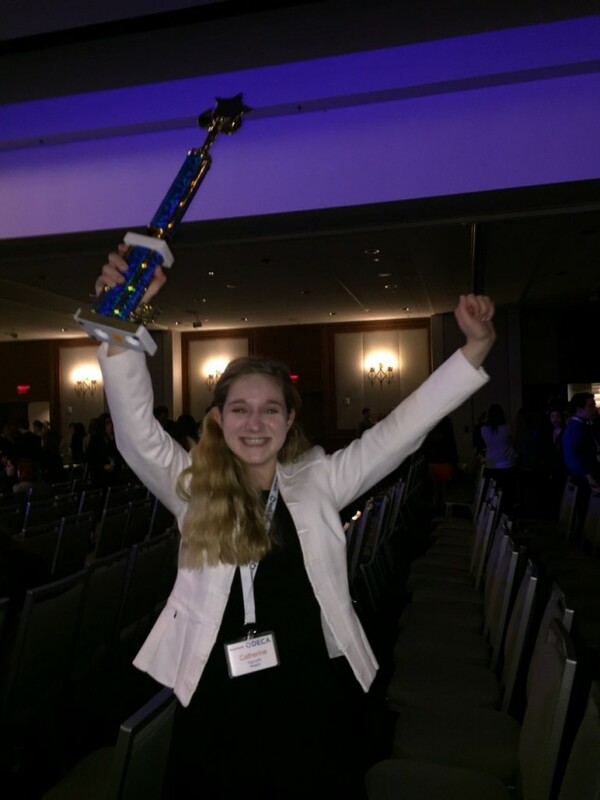 We caught up with her to learn about Catherine Argyrople Photography and how DECA is pushing her to reach new achievements in its competitions. Another large chunk of Catherine’s time back home has been spent creating her freelance photography business, which has been met with enormous success. Catherine has “worked with over 85 clients in 2015 alone, not only in my hometown of Weston, Massachusetts, but communities over 25 miles away as well.” To say that she is in-demand is a significant understatement! The inspiration for her photography business stemmed from her desire to go on a gap year before attending college. She figured she could use her skills in media and photography, which she had been developing in classes since middle school, to help fund it. So in the fall of 2014, Catherine began her freelance photography and never looked back. The competitions can be a huge and daunting task, but Catherine felt “more confident in my project and was really in my element while presenting my business plan in front of the judge. I put my all into this project, so seeing my hard work pay off was so surreal.” In her photography work, Catherine particularly enjoyed getting to know each of her clients during her photoshoots with them. It kept Catherine very busy; to the point where she felt like a “40 year old working mom, but I totally loved the whole experience.” She was busiest on the weekends, when she had 4-5 photoshoots each day. In addition to that, after school on weekdays was usually fully booked as well! In regards to her future, Catherine has a few goals and dreams. She is still planning on taking her gap year to travel and explore. She will be hearing back from the colleges she applied to soon and will be attending one of them in the fall of 2017 after her gap year is complete. Her career projections for herself include “two media related dream jobs: to be a movie producer like Steven Spielberg or Brian Grazer, or to be an environmental/ anthropogenic documentary producer for National Geographic. When I was at The Island School, I really discovered my interest for environmental advocacy media and can totally envision myself dedicating the rest of my life to this career… The Hollywood movie producer fantasy is just an aspiration I’ve always dreamed of.” Given her track record of reaching goals, it seems like Catherine is well on her way! 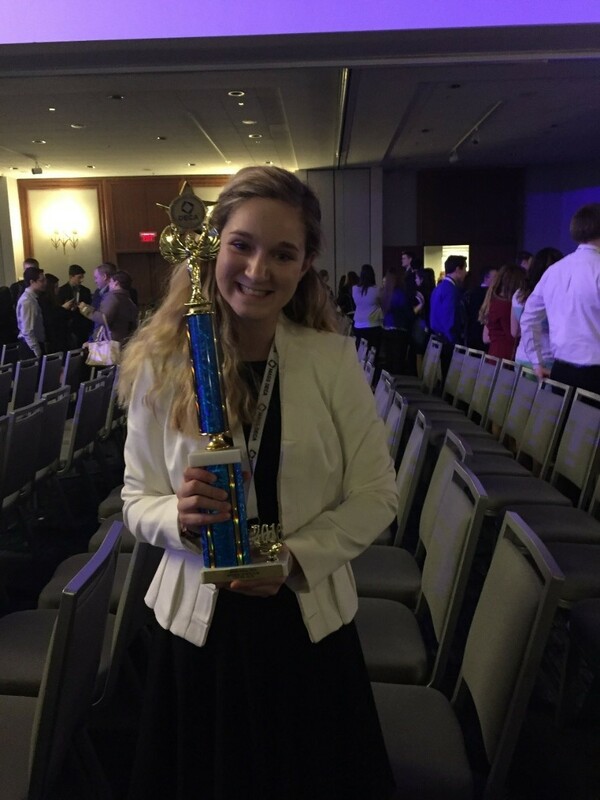 Catherine, best of luck to you as you hear back from colleges and compete in the DECA international competition. All of us at The Island School are rooting for you and hoping to hear about more of your successes! Many teenagers go through a period of their lives when they feel as if they are at a crossroads. For Anna, that crossroads occurred during her time at The Island School when she “was on the cusp of trying to live my dreams, but was definitely scared out of my mind and letting that hesitance hold me back.” The Island School and the Spring 2009 semester made her “a brave person at a time when I really needed bravery.” At one point during the semester, Chris Maxey talked “about returning from Eleuthera and becoming ‘Island School Heroes.’ Whether it was in our personal or professional lives, he was always inspiring us to change the world for the better and to never give up the fight.” Better still, it was not just Chris Maxey supporting Anna to follow her dreams, but the entire community of the school which “made it feel like anything was possible, each day.” If you believe it, it becomes true. 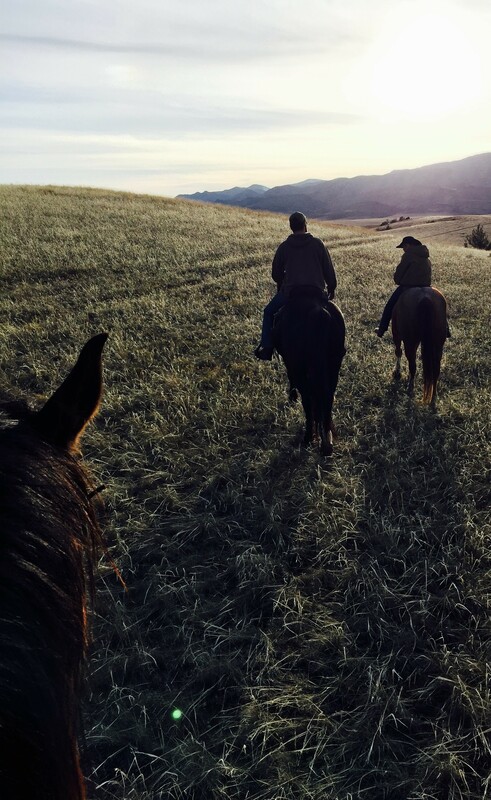 For Anna, being hired at Heroes and Horses was a major moment. 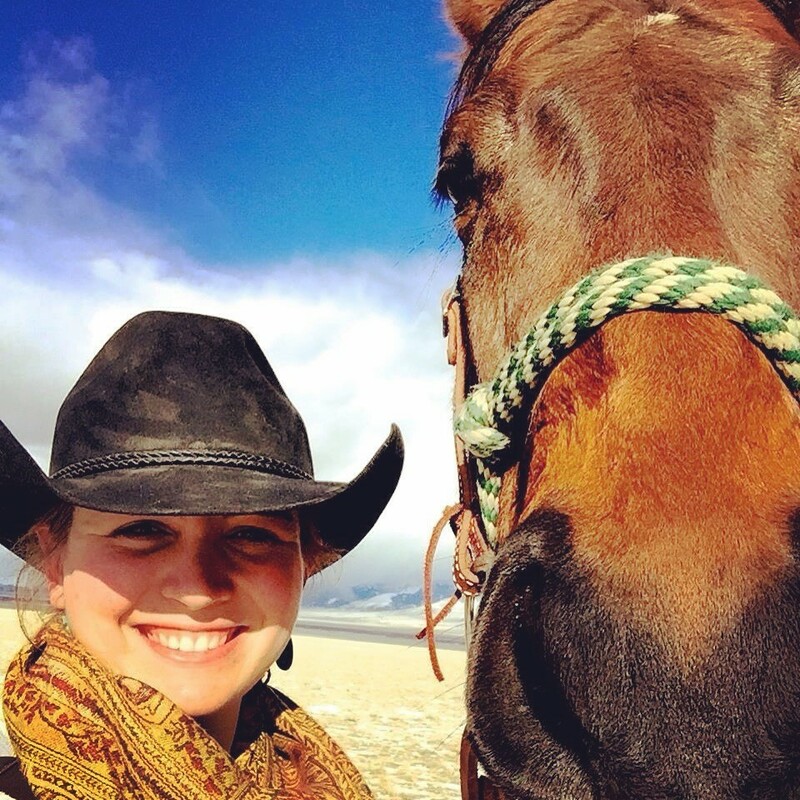 In her words, “the trajectory of my outlook on life completely changed.” Suddenly, Anna had transitioned from the life of a college student to a job where “I got to help people, ride in the mountains, and share with others in need the power of horses to heal and challenge the human spirit–all things I had dreamed of spending my days doing, but never dared to hope that it might become reality.” Similar to at The Island School where everyone is on the island because they want to be here and love what they do, Anna loves “that I work with people who love what they do every day. It fires me up.” Anna now spends her days in a situation she believes is “the best of both worlds” where she is working and communicating with the people who love what they do and the other is working and communicating with the animals that she has spent her entire life loving. We recently had a chance to catch up with Greg Henkes, an alum from the Spring 2003 semester, from our office on campus. We asked to hear his story of how he came to be at The Island School as a student and where he has been since. Greg was one of the first students from Maine to attend the Island School and hails from the town of Yarmouth. He originally heard of The Island School while in a meeting with his Guidance Counselor at Yarmouth High School. The counselor recommended to Greg that he go see “this random guy give a talk about a semester program they had started in the Bahamas”. That “random guy” turned out to be our very own Christian Henry who obviously sold Greg on the idea of attending The Island School. As things would turn out, Greg explains, “Christian is my neighbor now. I live in Cambridge, Massachusetts with my wife, our daughter Charlie, and two dogs”. Greg is now a postdoctoral fellow at Harvard University in the Department of Earth and Planetary Science, and he studies “the physical and chemical evolution of our Earth’s oceans on geological timescales”. Student-driven research was and is a large component of the semester experience. Greg’s current work reflects what he was inspired to study as a student. In addition to his work at Harvard, Greg also holds a positon on the Board of Directors of the Island School where he works to constantly improve the school for future generations of students. 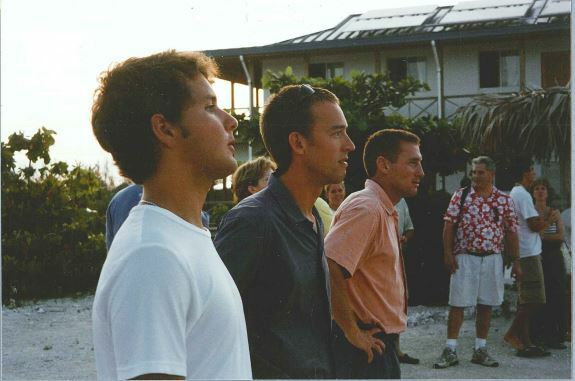 In a way, Greg and many other alumni never completely left The Island School after they boarded the plane home at the end of their term. Instead, they became driven to find meaningful and personal ways of giving back to the program that came to mean so much to them. 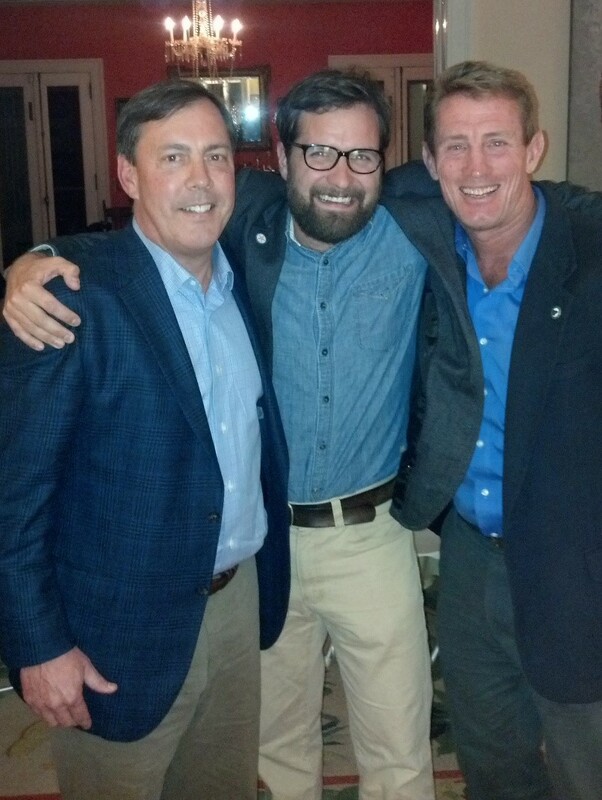 For Greg he “made alumni giving a personal priority, but I wanted to go deeper than that”. With his well-earned Ph.D. in hand, Greg decided that he was in a unique position with his skillset to benefit The Island School, so he applied to and was subsequently accepted into the ranks of our Board of Directors. Since joining, he has leveraged his scientific and personal interests to further the development of “the integrity and quality of research done by Island Schoolers and CEIS/CSD scientists and engineers, safety and student culture and attracting quality students.” As a scientist, Greg loves to learn, and being an active member of our board has afforded Greg the chance to continually learn as he interacts with his fellow members. The Island School inevitably has different effects on everyone who attends the semester program. Greg looks back on his time at The Island School as a “period of tremendous growth.” He was transformed physically and mentally from a “crew cut high school hockey jock from Maine” to a “passionate young adult, albeit over-tanned and with shaggy hair, but also ready for college and the next adventure.” For Greg, the experience “laid down the framework for a career in the Earth sciences.” Greg’s new career goals were highlighted by the time he spent at The Island School compelling him “to be outdoors more often and having a sharpened intellectual curiosity.” When Greg attended Bates College, he found himself drawn towards studying Earth Sciences and attributes it to the fact that it is “hard to imagine SCUBA diving nearly every day or having math class on a boat not push someone towards studying the Earth.” While at Bates, Greg connected with future faculty member David Miller. They became good friends in college and even started a Student SCUBA Club at Bates. “We bought equipment and ran open water classes. It was a hoot! We did some really cold Maine dives together too!” When it came time for David to apply for a job at The Island School, Greg gave him the official “Henkes stamp of approval” with a recommendation to Chris Maxey. David spent three years teaching literature and SCUBA on The Island School campus and was the Dean of Students for a year. While at The Island School, David brought with him a metric ton of energy, a passion to change the lives of all of his students and the ability to make anyone laugh. All of this happened because Greg happened to meet David at Bates! Greg, thank you for all that you have done and continue to do for The Island School! We look forward to having you on island once again this April for the board meeting. Recently, Francesca Forrestal of the F’99 semester became part of a very select group of Island School Alumni because she graduated from the University of Miami with a Ph.D. from the Marine Biology and Fisheries department studying the “Impacts of the tropical tuna purse seine fishery on the surrounding ecosystem structure and function.” Here at The Island School, we were curious to learn about Francesca’s journey from one of our students to a full-fledged Post-Doc; so we asked her! Francesca attended the Nightingale-Bamford school in New York City. She had just returned from a semester abroad in Australia and was “having trouble getting back into city living” when she heard that a fellow student had just returned from The Island School’s first semester that spring. 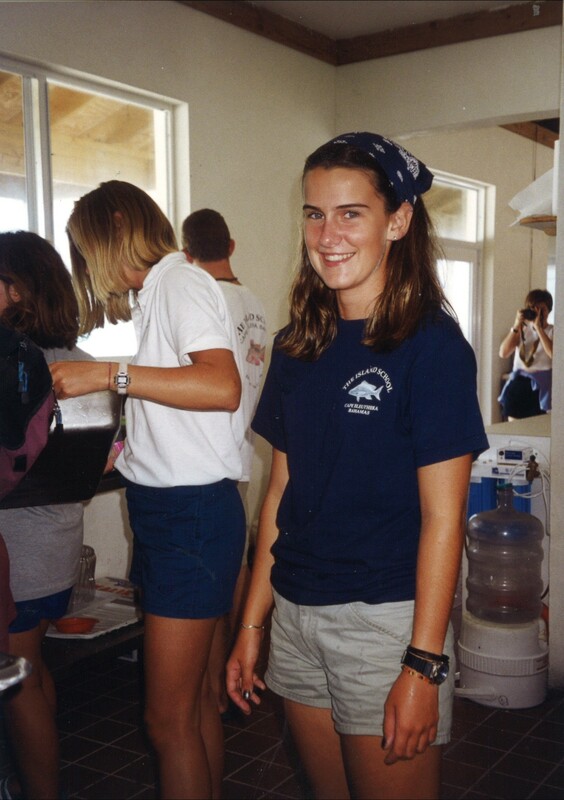 She learned that a friend of hers, Suzy Newbury, was applying for the Sp’00 semester so Francesca took a chance and successfully applied to join the F’99 semester. Even before attending The Island School Francesca knew she wanted to study Marine Biology but she was not sure which aspect to focus on. She joined the aquaculture research group which “sparked my interest in sustainable fisheries”. While out on her 8-day kayak expedition Francesca spent time talking to a faculty member about her time at UC Santa Cruz “which is where I eventually attended and received my bachelors in marine biology”. Once Francesca had returned home from The Island School, she took on an independent study in her senior year of high school. Her project revolved around the concept of how much of an “impact SCUBA divers can have on the coral reefs they visit”. As part of this course, Francesca obtained her PADI Dive Master and Instructor training which she used to teach diving both in “Manhattan and then throughout the Caribbean after graduation (including at the Island School!)”. Clearly the road to a Ph.D. is full of challenges but with dedication and a good advisor, it can be done! 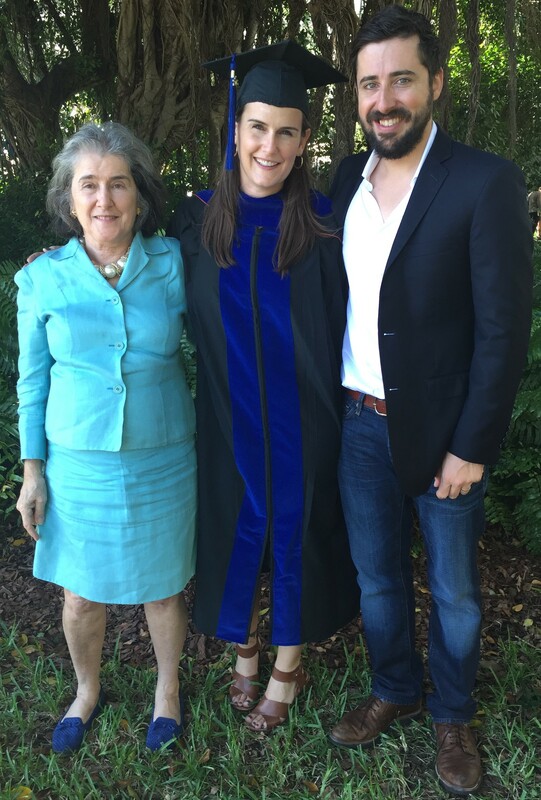 Now that Francesca has completed her degree, she is working “as a Post-doctoral Associate at the Cooperative Institute for Marine and Atmospheric Science in Miami”. She very much enjoys the opportunity to work with highly migratory species “as there are so many interesting aspects to their biology and ecology”. Francesca hopes to continue working in this field for the foreseeable future. In addition to studying for her degree’s Francesca was the first ever alum to join the Island School’s board and she has served continuously for 10 years. She has had an incredible journey from student, faculty member and now board member. Joining the Island School’s board was a first for Francesca and has given her “an incredible learning experience”. Each board member “brings such a unique perspective and set of skills. Its very enlightening to watch how everyone approaches the same challenge given his or her background and training”. Incidentally, the board is looking for new membership at the moment. Check out this post if you are interested in applying! 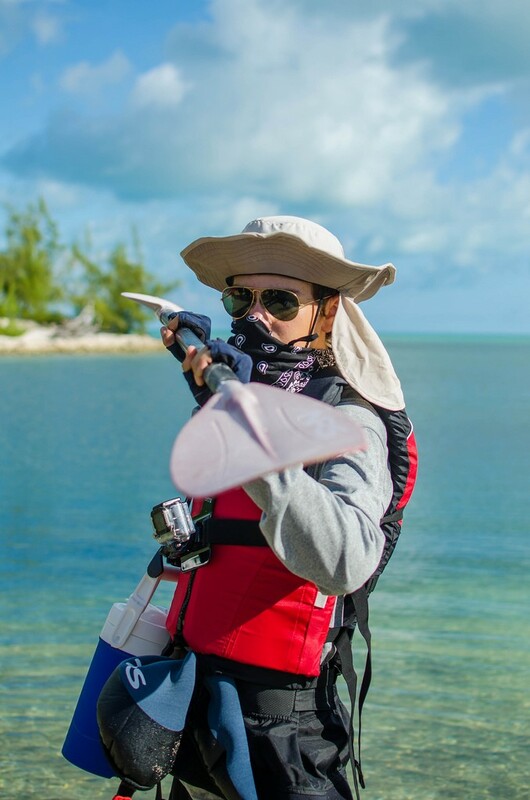 When asked about a favorite memory from her semester at The Island School, Francesca says that her most vivid memory “is coming back to Eleuthera after we had evacuated to Florida for 5 days because of Hurricane Floyd. We had been on the island for less than a week before we had to leave and it already felt like a homecoming when we flew back into the Rock Sound airport”. Francesca during thanksgiving dish crew in the F’99 semester. Nicole compared her time in Ghana to The Island School by saying that both were life changing experiences. She also found similarities in the people who she described as “inspiringly positive about life”. For Nicole, the best part of the trip was the people. 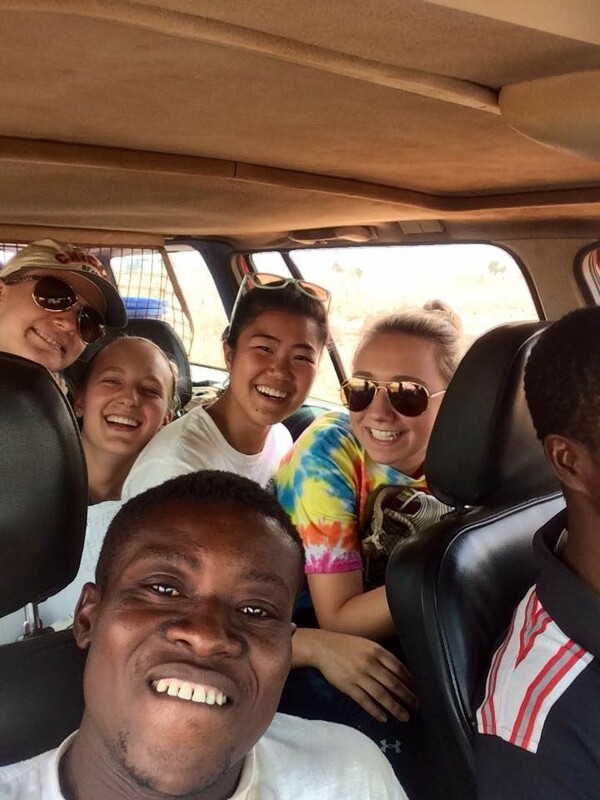 She “learned so much about the Ghanaian culture through talking to my translator, Nestor, and the other translators we got close to along the trip. They showed us their homes, their families, where they like to have fun and really shared their lives with us. We ate all the best with them and experienced local food such as baku, T-Z, eggs and bread, Guinea fowl eggs and lots of rice and chicken”. The entire reason why Nicole is involving herself in projects like Saha Global is because of her interest in sustainable development. Her time at The Island School inspired this in her and “it is because of The Island School that I am so passionate about what I study” which is a double major in Environmental Engineering and Sustainable Development. Nicole fell in love with her program because “it allowed me to peruse a major that wasn’t just cut and dry. One that allowed me to work hands on, take classes other than just engineering and especially that would encourage me to study abroad. The Island School was a lot like my program because it wasn’t the classic school education, it has flare and allows a student to really delve into what one would be doing in the work place and to look more holistically”. Nicole has several goals for her project: that it will be successful, “for it to provide the village of Naha with fresh drinking water and for it to stay sustainable and successful for many many years to come”. She has faith in the women that her group trained and in the village as a whole that by the time she makes it back in the future, everything will be “running like a well-oiled machine”.